Authorities in Hamburg said Wednesday they would ban some diesel vehicles from two major arteries to improve air quality, making the German port city the first to take the long-feared step. "Driving limits for older diesel vehicles can now come into force as planned" thanks to a decision by a top court, the city-state's government said in a statement. A 1,600-metre (one mile) section of the Stresemannstrasse highway in the Altona district will be closed to older diesel trucks from May 31. 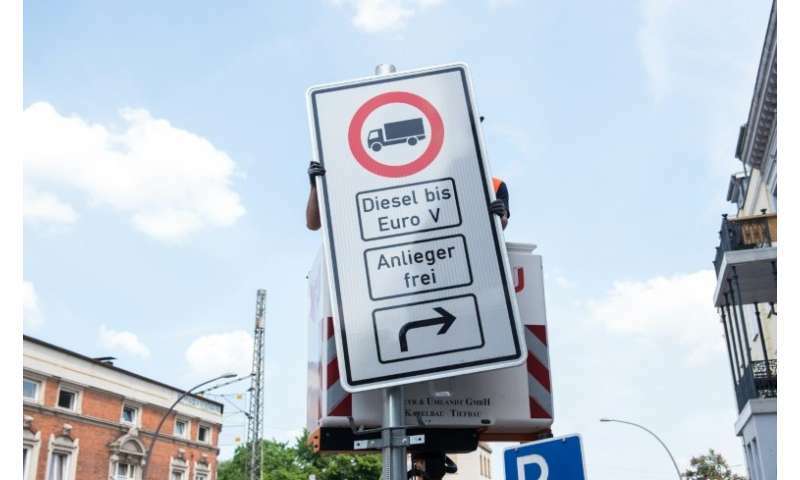 Meanwhile both diesel-powered trucks and cars that do not meet the latest Euro 6 emissions standards will be banned from a 580-metre stretch of another major and heavily polluted road, the Max-Brauer-Allee. Exemptions will be allowed for local residents and businesses as well as for delivery vehicles, ambulances and rubbish trucks. The late February decision by Germany's top administrative court that cities could ban older diesels from certain roads to cut pollution has set drivers on edge. Government officials have been scrambling for ways to improve air quality without imposing bans. They fear exclusion zones could disrupt citizens' lives and the economy as well as taking a massive bite out of the resale value of older diesels. "We have a very concrete set of measures with the clear aim of cleaning up the air without limiting mobility," such as subsidies for electric vehicles and hardware refits to older diesel bus fleets, Transport Minister Andreas Scheuer told the Augsburger Allgemeine newspaper Wednesday. While some 66 cities exceeded air pollution limits last year, Berlin aims to bring the number down "very quickly into the single digits," he said. But sales of diesel cars have already slumped, following years of scandal around millions of vehicles rigged by car giant Volkswagen to fool regulators' emissions checks—with suspicion falling on other carmakers as well. So far the government has rejected the idea of forcing automakers to pay to refit older diesels to meet the latest emissions standards. It is "not in our interest to weaken the car industry with political measures so that it has no ability to invest in its own future," Chancellor Angela Merkel told parliament last week. Germany's concern for its car industry finds short shrift in Brussels, where the European Commission said last week it was taking Germany and five other member nations to court over their failure to meet the bloc's air quality standards. It's a start at least. Diesel engines are still nasty, poisonous contraptions and the best way to get rid of them is to get rid of them as quickly as possible. There is no such thing as clean diesel. Gasoline is bad enough, but diesel is just plain foul. 'bout damn time. There's 70 cities that are above the legal limit and all politicians have had to say was "we have an idea to push that below 10"...and that idea has so far been...zilch. Can't touch the holy grail of car manufacturers - noooo. Meanwhile one "defeat device" after another is being uncovered (what was it this week? Audi and Porsche? ).